TORONTO — In an effort to quell an ongoing controversy around police presence in Canada's largest Pride parade, Toronto's police chief announced Friday that his force would not be participating in the annual event this year. 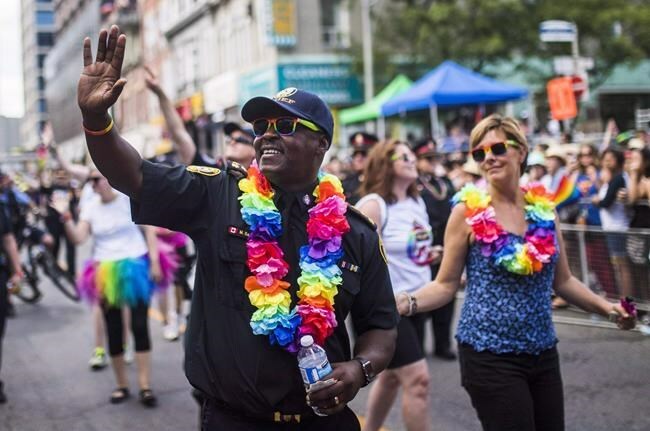 Chief Mark Saunders pointed to divisions within the LGBTQ community as the primary reason for his decision, but emphasized it "will have no impact" on the force's outreach efforts. "There is a fragment within the LGBTQ community and part of that fragmentation involves us," Saunders said in an interview. "So by taking us out of the equation, they'll have a better opportunity to focus on what issues need to be looked after." The presence of police in the parade emerged as a contentious issue when the parade was interrupted last summer by a protest from the local chapter of Black Lives Matter. The parade only resumed when Pride Toronto's then-executive director, Matthieu Chantelois, signed a list of demands from the group that included a ban on police floats in future parades, as well as greater representation for marginalized groups. Chantelois, who has since resigned, later said he only agreed to the demands to get the parade moving. After the incident, Black Lives Matter Toronto said it was flooded with hate mail, some of it sent by members of the LGBTQ community. It pointed to the vitriol as an example of the racism it said it was trying to combat. The group said it opposed police presence in the parade because it could discourage marginalized communities from participating. Pride Toronto issued an apology in September for what it described as a "history of anti-blackness'' and "repeated marginalization of the marginalized'' within the LGBTQ community. The tensions flared up again last month when members voted at Pride Toronto's annual general meeting to adopt a set of Black Lives Matter demands, including banning of police floats from Pride marches and parades. On Friday, Saunders said no uniformed members will participate in this year's event, although off-duty, non-uniformed officers are free to attend if they want to. Toronto police will still hold its annual Pride reception, he said. "We have a very strong relationship with a vast majority of members of the LGBTQ community," he said. "However, it's been made very clear that there is a small marginalized section of the community right now that we need to develop those relationships with." Pride Toronto called Saunders' decision a positive development. "Pride Toronto is committed to continuing the important dialogue that has taken place with our membership and the broader community. We are listening. We will listen. What we have seen from the Toronto Police Service is that they are also listening," it said. "Their actions reflect a commitment to continuing the conversation with our community to move forward." Pride Toronto emphasized, however, that Toronto police officers were still welcome to march in the parade "as members or allies." But the Toronto chapter of Black Lives Matter said it was disappointed with Saunders' statement. "They are trying to flip the narrative and make it seem as if they are choosing to pull out of Pride when in fact they were uninvited," said spokesperson Syrus Marcus Ware. Marcus Ware said the group was frustrated Saunders made no mention of issues such as "anti-blackness and policing" and carding — a controversial practice of street checks that the group says unfairly targets young black, brown and indigenous people. The head of the Toronto police union also disagreed with Saunders' decision, calling it "political pandering." "I think that this sends a very negative message to our members about inclusivity," said Mike McCormack, president Toronto Police Association. "All this is doing is creating a negative environment around something that should be positive." The Toronto chief's decision comes just days after Halifax's police force said it would not participate in that city's Pride parade this year. Halifax Regional Police said the decision was made after months of discussions with Halifax Pride, and took into consideration the "national debate'' about police involvement in such events. — with files from Liam Casey.